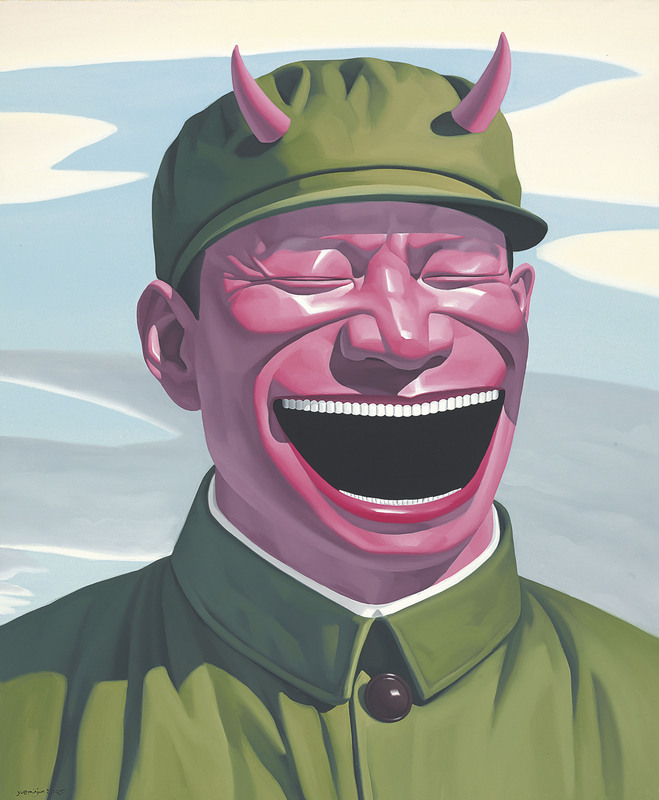 Do Yue Minjun self portraits make you laugh? 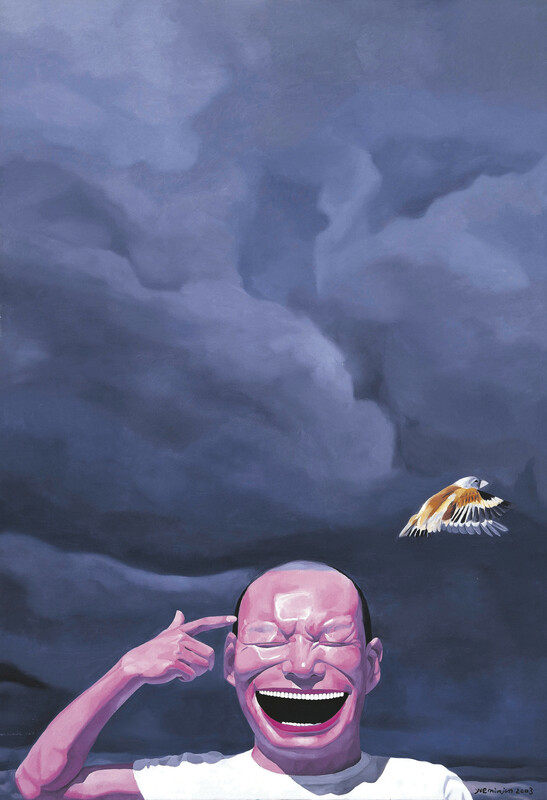 Cynic realism or personal expression? 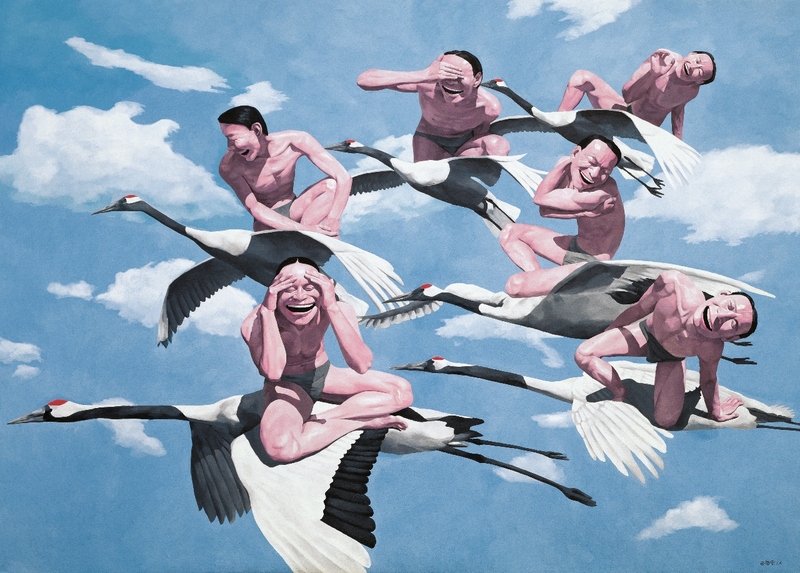 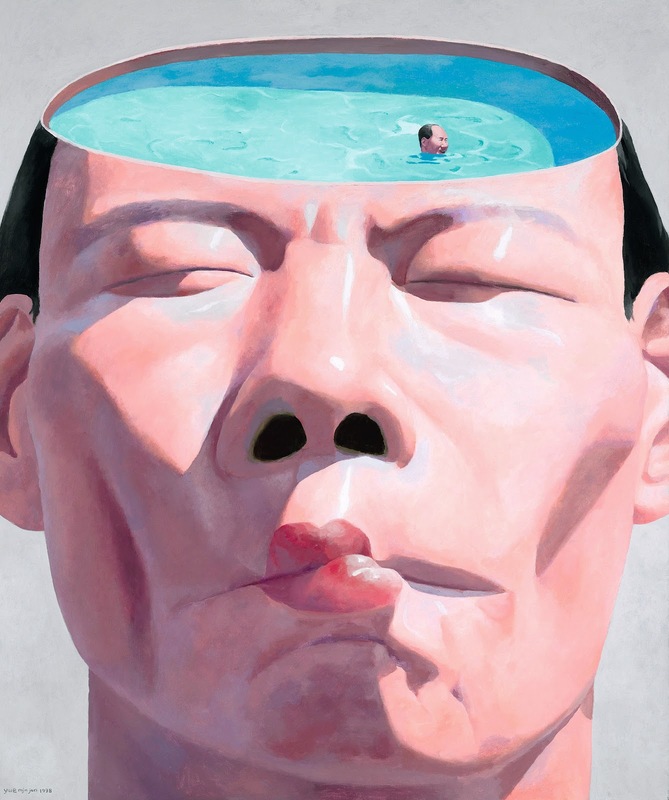 Yue Minjun’s style is easily be recognized. 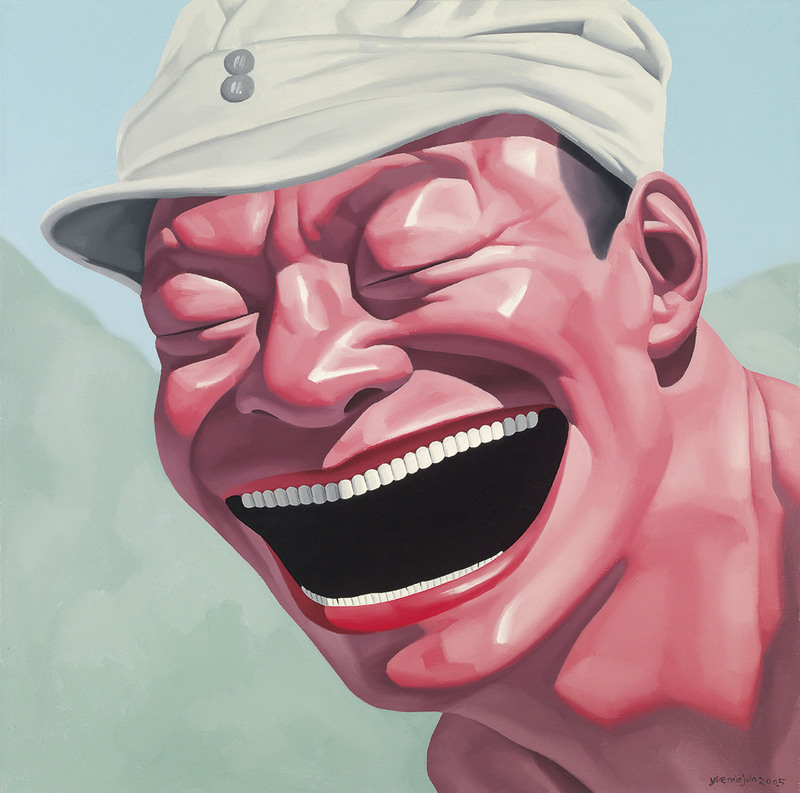 His self-portrait oil paintings depict himself in vivid colors while grinning with his mouth gaping. 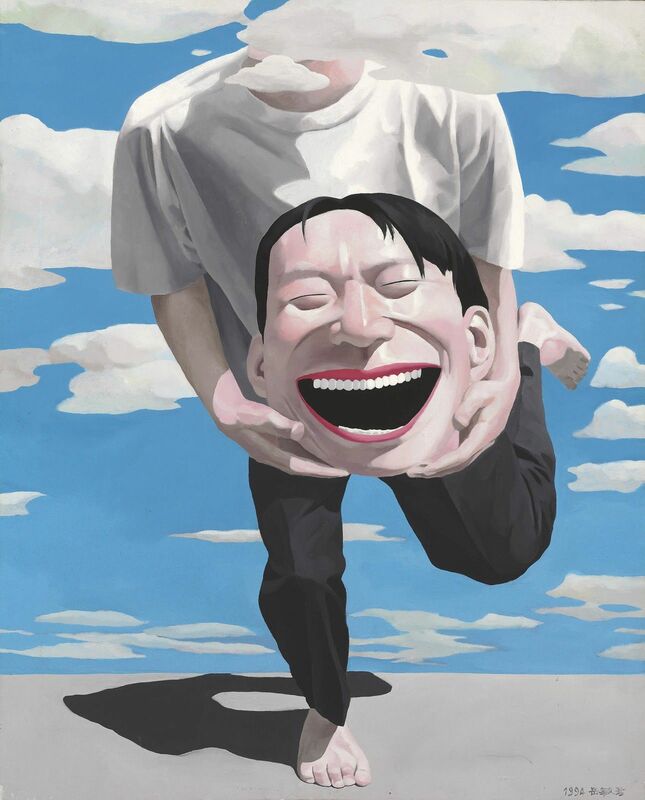 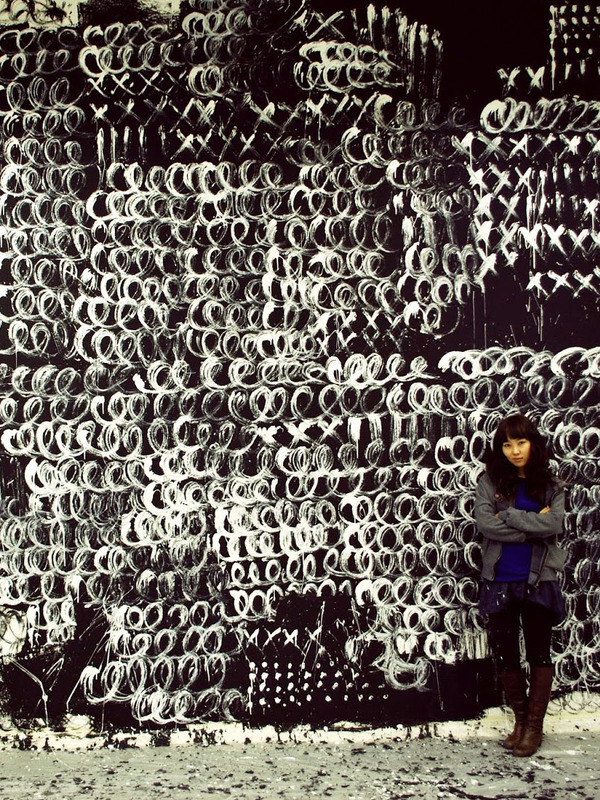 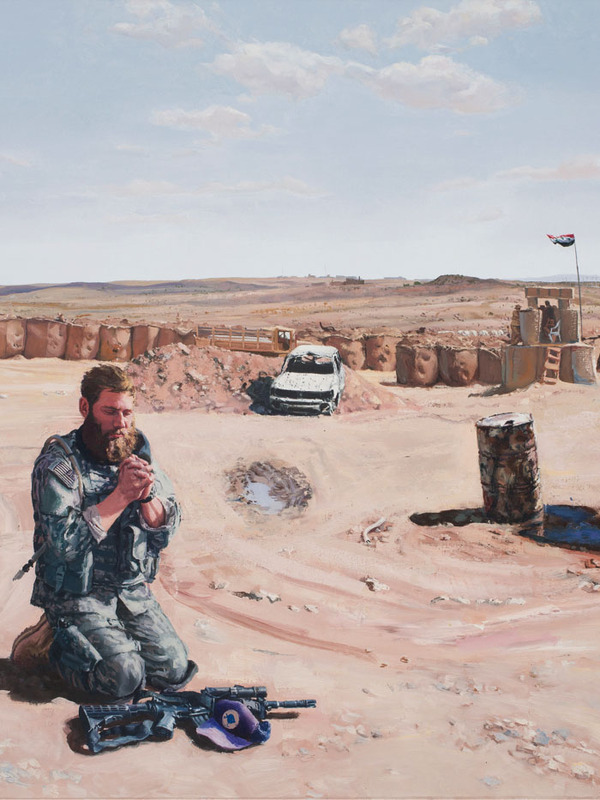 An oxymoron of sorts, the self-portraits evoke feelings of sympathy as well as humor. 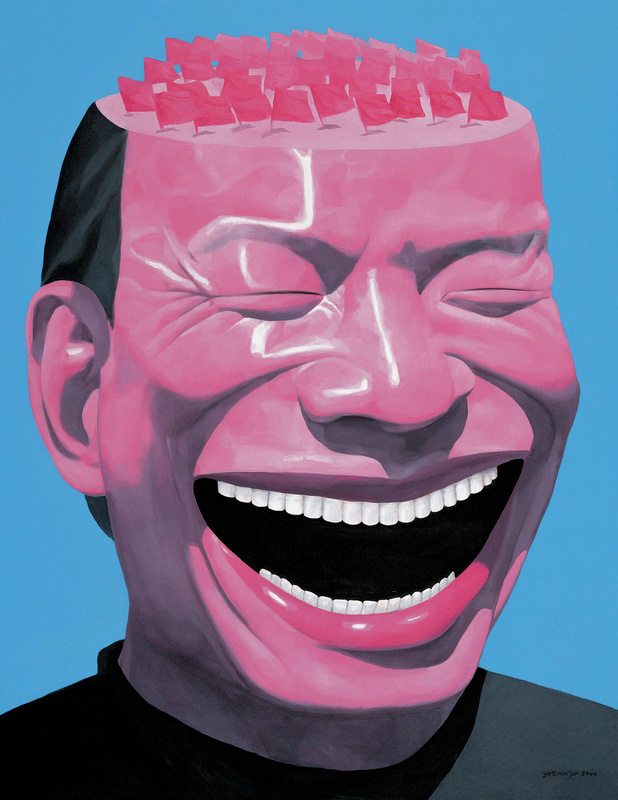 The depictions of himself in various poses laughing draw numerous diverse interpretations, though the general consensus is that while the self-portraits are meant to display humor, they also show the complexities found underneath the outer surface. 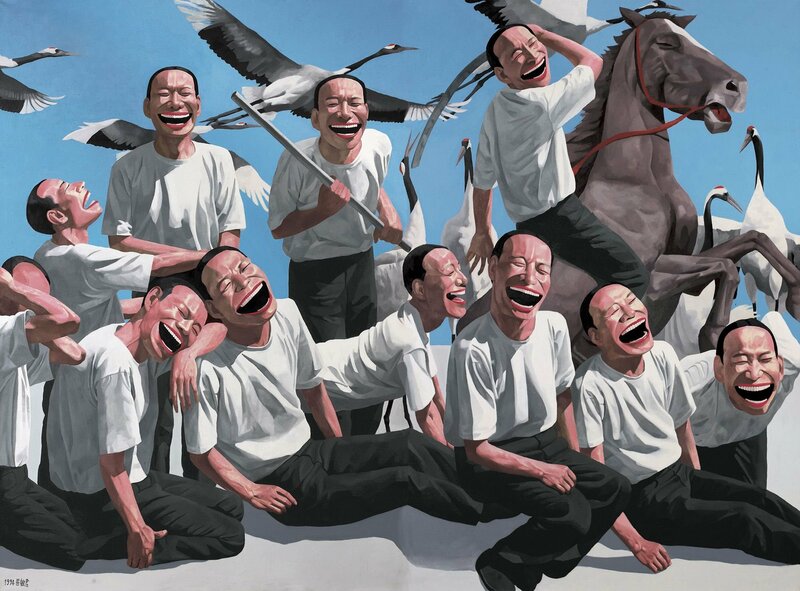 A first cursory look gives off the impression that the figures are happy and amused, but the more one looks, the more the paintings give off an air of uneasiness, tension and unsettledness that the blue skies and toothy grins cannot mask. 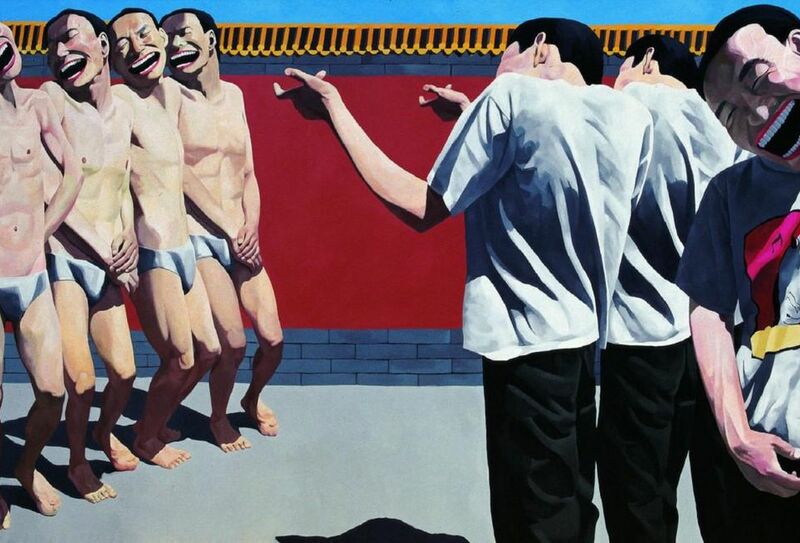 The repetition of these figures in various variations such as various settings lends a powerful effect on the overall tone of his self-portrait series. 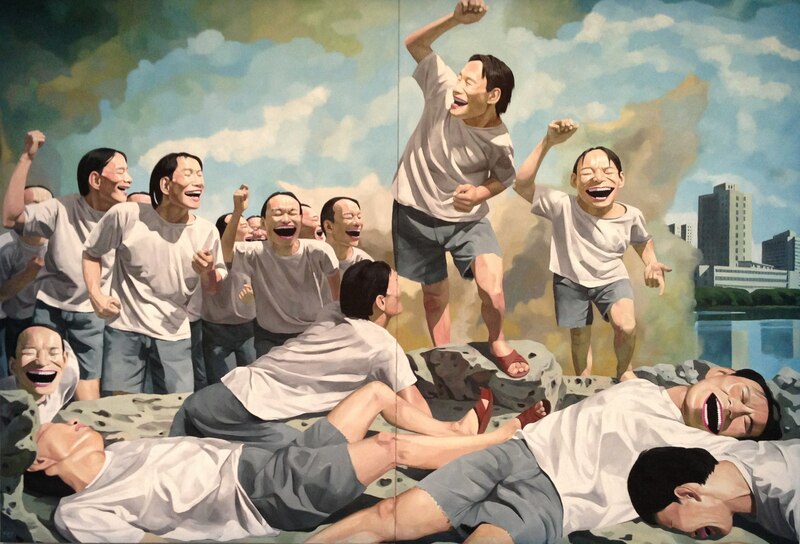 However, the most interesting detail apparent from looking at Minjun’s self-portraits is that his doppelgangers, the protagonists of his work are placed in situations that are tragic, comic, ludicrous or improbable whether in Freedom Leading the People, fighting for peace and based on Eugène Delacroix’s iconic French Revolution painting1, in Untitled, headless and carrying his severed head, and in Sky, flying cranes among other situations. 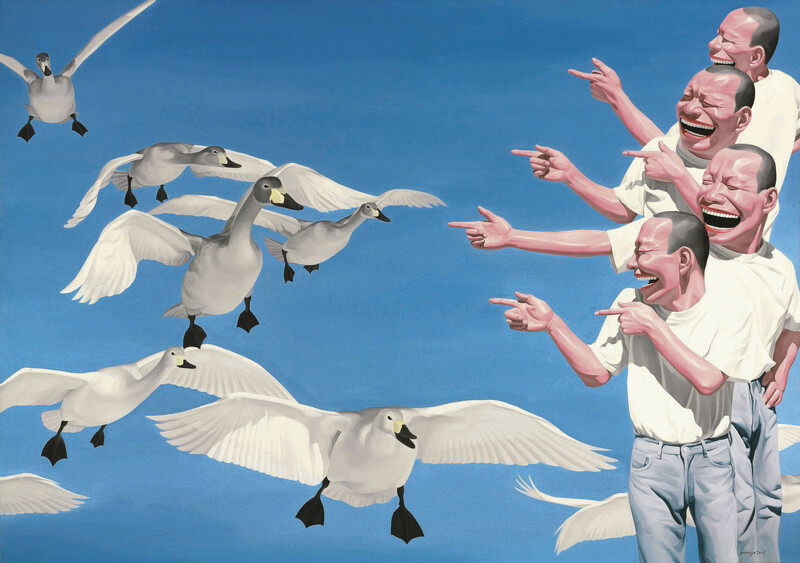 One is kept guessing, left to their own interpretation as to what is going on. 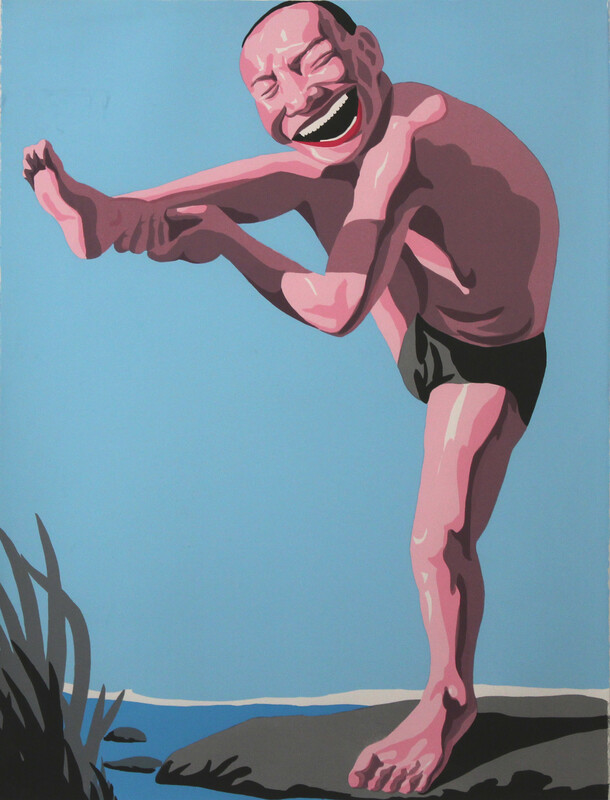 His fascination with philosophical inquiries and existentialism inspired him to use a humorous approach by using cartoonism resulting in grotesquely contorted figures wearing pink skin, manic expressions and toothy grins, exaggerated expressiveness that plant the doubt in viewers that the doppelgangers’ mirth is not all that sincere. 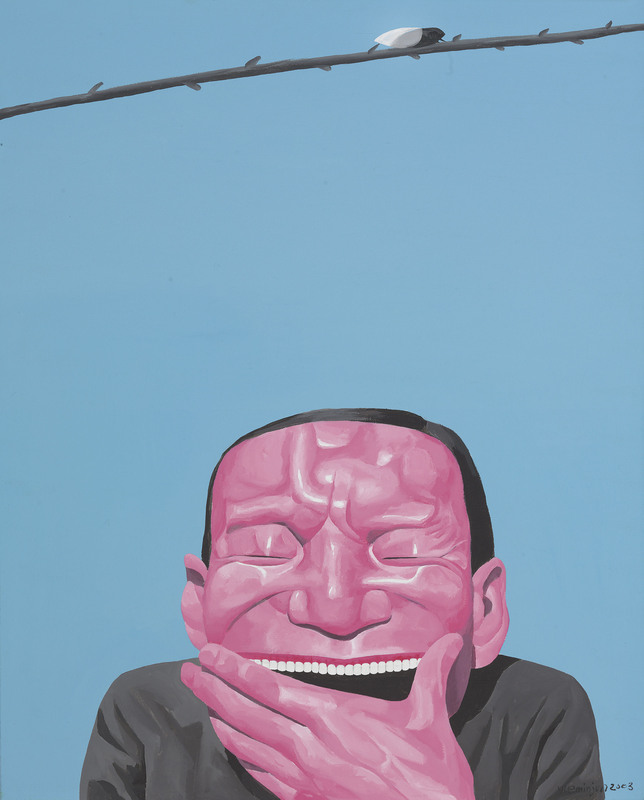 The laughter is not only used to express humor but also masks violence and vulnerability beneath the façade of some of Minjun’s self-portraits. 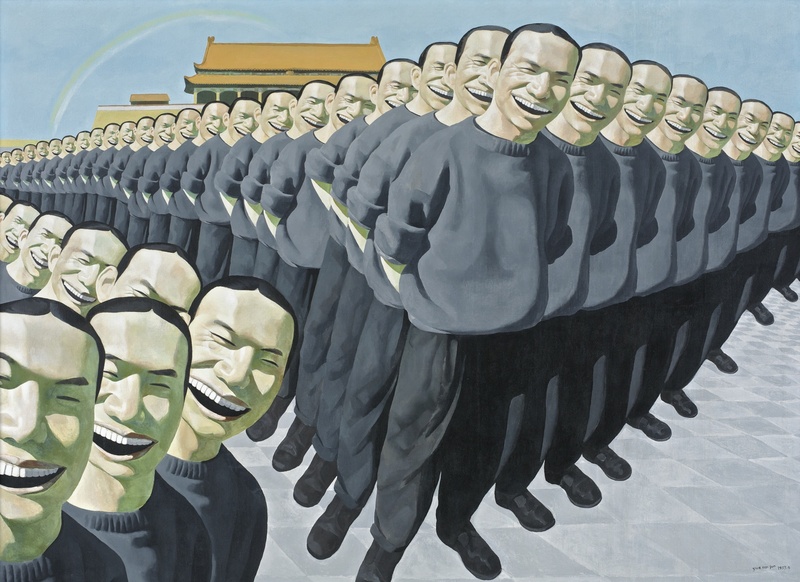 While some categorize the self-portraits as cynic realism, the artist dismisses this and maintains that they are a form of personal expression. 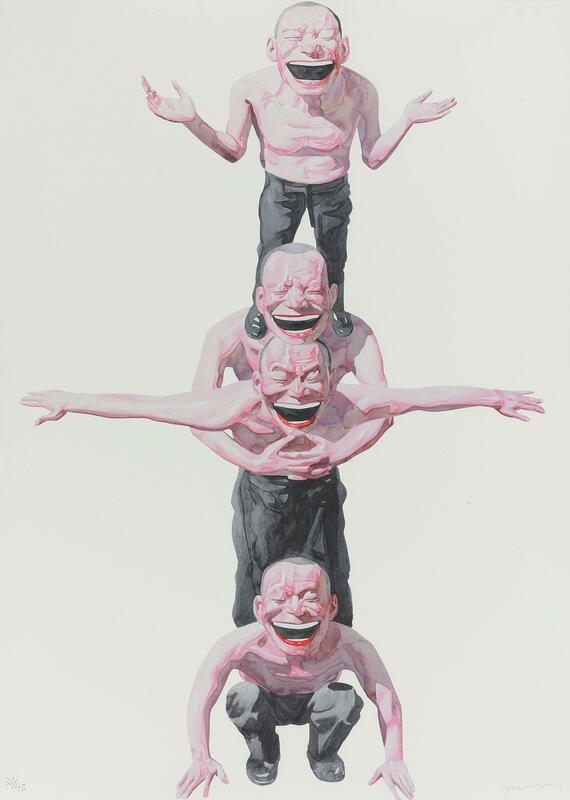 Yue Minjun opens up about his work and how little he received of his 5.9 million USD record-breaking Execution work at Sotheby’s2. 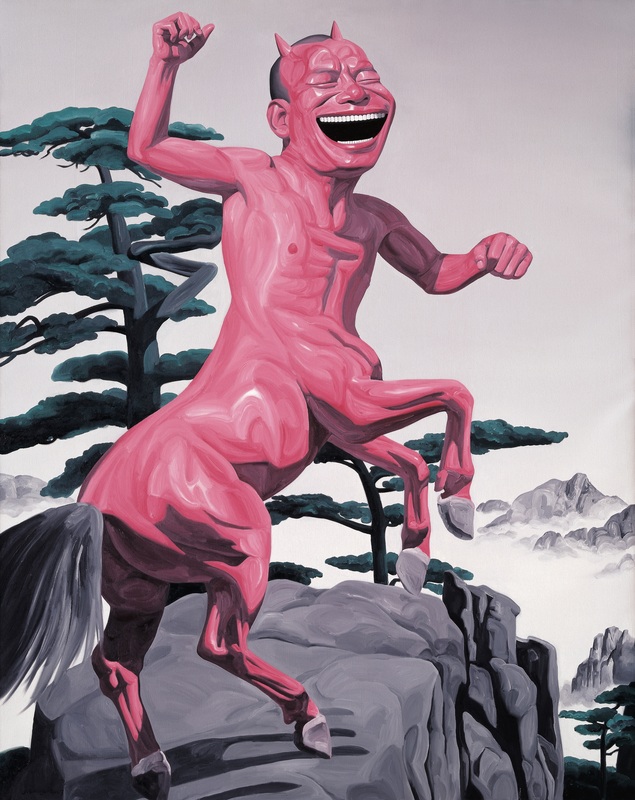 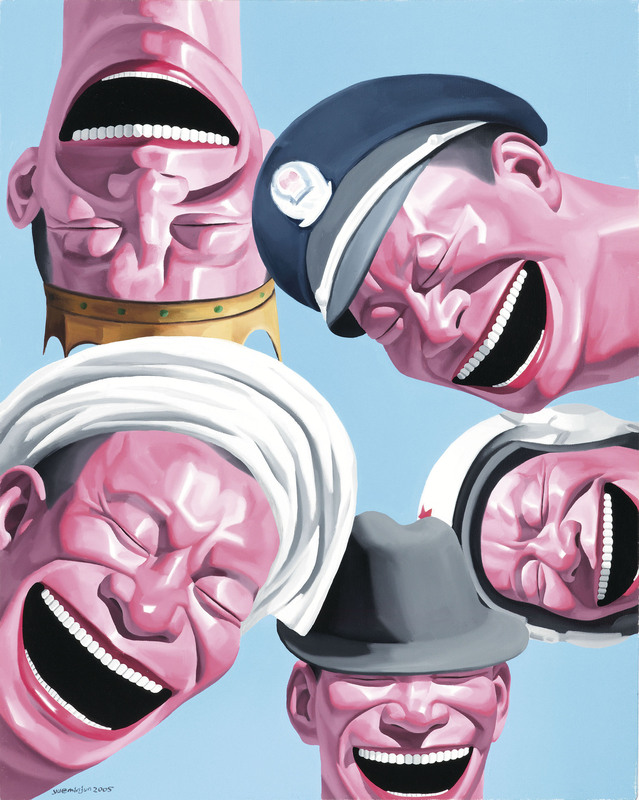 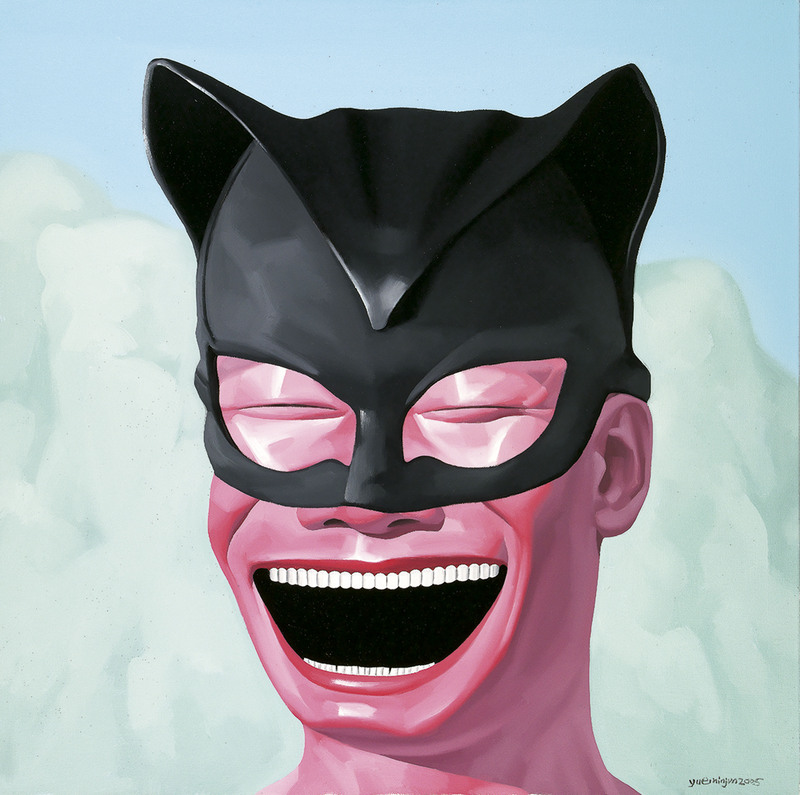 Home > Painting > Do Yue Minjun self portraits make you laugh? 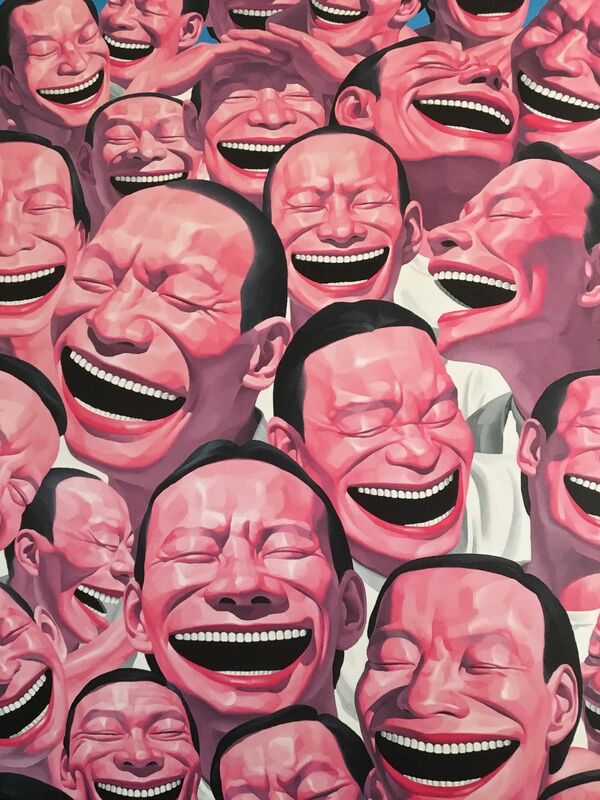 Posted on January 25, 2019	in the category Painting and tagged Art in Beijing, Art in China and by Chinese artists, interview, other, painting, portraits, Yue Minjun.